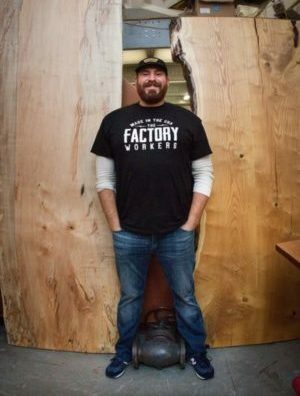 THE FACTORY WORKERS opened its doors in 2013 as a makerspace created using salvaged machinery and equipment from factories and shops that had closed down or gone out of business in the Philadelphia region. But this whole thing started long before that. My family started their own business, Marchetty Machinery, the year I was born. They serviced industrial machinery for all the factories in Philadelphia in the ’70s, ’80s, and ’90s. During this time, more and more of the factories Marchetty Machinery served were going out of business due to the rise of foreign trade. When those factories went out of business, my family would purchase the old machines, fix them up and resell them to smaller companies that were just starting off. Over the years, more and more shops and factories continued to close in this region, and an increasing number of people were coming to us to purchase machines for the operations they’d moved to other countries. I got tired of seeing these great old machines sent abroad and not being used here in the United States, so I decided to do something about it. I bought an old foreclosed movie theater, fixed it up, upgraded the electrical, and moved machinery into the building. That building became The Factory, New Jersey’s largest makerspace. Now, we’ve also built office and studio spaces to help other kinds of workers, from illustrators to tech startups to music teachers. The Factory Workers is a dedication to all the men and women who lost their jobs. People come to The Factory to access those machines we saved to build and make their dreams into a reality.